Found an awesome program for sharing / managing passwords within a smaller organization. It is called WebKeePass and is based on KeePass to a limited degree. I managed to get this tool working with Active Directory based authentication. The trick is to create a user called “admin” in AD after you get AD authentication working. Then you can use this user to create rights and privileges for other users within WKP. Unfortunately, the access controls are not integrated with AD groups, but again this seems to be targeted towards smaller organizations. Email email email. I have for years tried to better organize my email and eventually – due to the sheer volume it became readily apparent to me that even how much time it takes to process an email is relevant. Those seconds add up. I HATE the way outlook is designed. 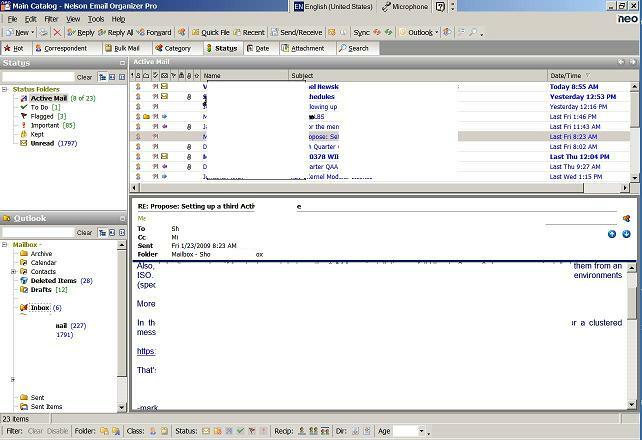 However, I have found a 3rd party add on to Outlook that is Outstanding. It is one of those programs that just works. It is called NeoMail. I have include a basic screen shot below to wet your appetite, but you might want to check it out. Yes the link above is a referral, and yes I use this program on a daily basis. It helps me process up to 1000 messages a day in an effective manner. Now if I could get something similar for RSS feeds. You are currently browsing the TrojaTech Tips and Articles weblog archives for the month August, 2008.